Ah yes, the parents! Do they have any role to help the child succeed? You bet! In fact, it is my opinion that without the parents' involvement, we should not expect too much from the young student. 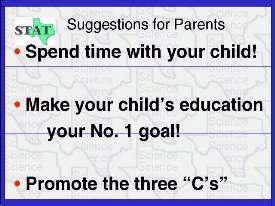 So my message to the PARENTS- spend more time with your child! But go beyond just spending "time". Make education your number 1 goal. This is a gift which you can give your child.